You dream it. You build it. 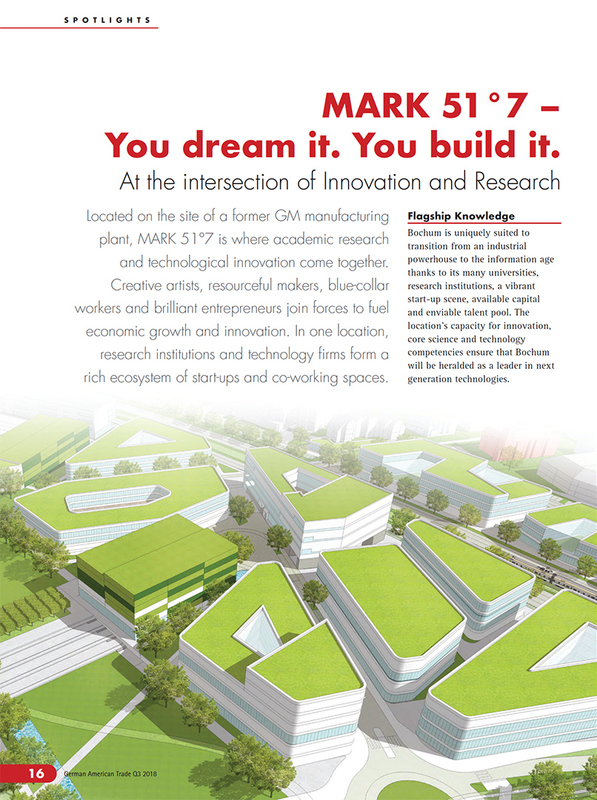 Located on the site of a former GM manufacturing plant, MARK 51°7 is where academic research and technological innovation come together. Creative artists, resourceful makers, blue-collar workers and brilliant entrepreneurs join forces to fuel economic growth and innovation. In one location, research institutions and technology firms form a rich ecosystem of start-ups and co-working spaces. Bochum is uniquely suited to transition from an industrial powerhouse to the information age thanks to its many universities, research institutions, a vibrant start-up scene, available capital and enviable talent pool. The location’s capacity for innovation, core science and technology competencies ensure that Bochum will be heralded as a leader in next generation technologies, as is evident by it being the home base of the Cluster of Excellence RESOLV. Nostalgia for times like the 1950s Fordist economy is nice, but it’s not what’s driving economies of the future. Dependence on innovation is key and Bochum’s MARK 51°7 is forging ahead with access to the tools of tomorrow in a collaborative environment that puts creativity above all else. And since Bochum has become the epicenter of cryptology and encryption technology, the success is already showing. MARK 51°7 in Bochum is at the core of the fourth biggest metropolitan area in Europe. It’s interwoven network of communities form a hub for regional and international connectivity. Flexible, efficient and sustainable. That describes MARK 51°7’s infrastructure perfectly and is why it has a distinct competitive edge when it comes to technological developments and Industry 4.0. Regeneration units and geothermal power provide sustainable energy supply, e-mobility reduces the use of fossil fuels and fiber optic cable creates lightning fast internet, directly connected to the most powerful internet exchange points worldwide (CDE-CIX & AMS-IX). If you want to see how to attract new jobs and foster burgeoning industries, look no further than Bochum. They’ve forged a new identity that embraces resourcefulness, creativity and innovation. Their universities, startup incubators, makerspaces, FabLabs, sports events, exciting music and art scenes, parks and green initiatives all round out an ideal location for MARK 51°7 to nurture the next generation of specialists and creatives.